2019 is slated to be an important year for IT, as digital transformation continues to grow in fervency and business value becomes more intertwined with technology. But sketching out and executing transformation plans isn’t a simple task. 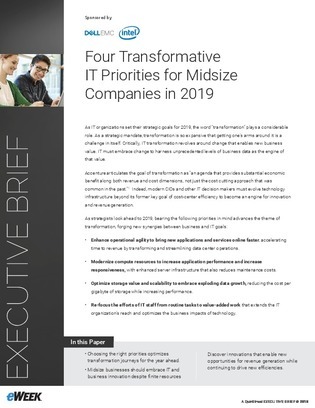 Inside this article, find out how to choose your IT transformation priorities in the year ahead. Plus, learn about the technologies primed to drive new efficiencies – and in turn, prime new avenues for revenue generation.